Dr. Calvin Kim attended the University of California at Berkeley as an undergraduate. After graduating with a B.A. in Molecular & Cell Biology, he attended the University of Pennsylvania School of Dental Medicine in Philadelphia, PA. where he received a degree in Doctor of Dental Medicine (D.M.D.) in 2001. 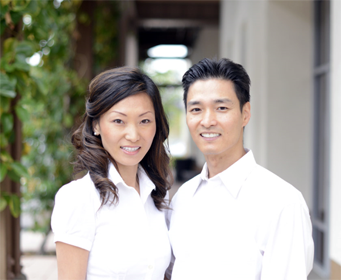 Afterwards Dr. Calvin Kim went on to complete a General Practice Residency at the West Los Angeles VA Hospital, where he received extensive training in general dentistry, oral surgery and hospital dentistry as it relates to dental medicine. He has been an attending dentist at the UCLA Urgent Care Center and a chief resident at the West Los Angeles VA Hospital. Dr. Calvin Kim is passionate about using today's latest technology in dentistry, especially using CEREC to restore teeth with porcelain in 1 visit! Dr. Sonia Kim attended the College of Charleston in Charleston, South Carolina and graduated with a B.S. in Biology. Afterwards, she received a D.M.D. degree at the Medical University of South Carolina in 2002. Dr. Sonia Kim is certified in Invisalign as well as in therapeutic Botox by the American Academy of Facial Esthetics. Dr. Sonia Kim is enthusiastic about Invisalign, which can straighten teeth without unsightly braces! Both doctors are active members of the American Dental Association (ADA), the California Dental Association (CDA) and the Santa Barbara-Ventura County Dental Society.